After a week spent in hot and humid Orlando, we headed to historic Washington DC where we spent another week sightseeing and getting to know the nation’s capital and its’ numerous monuments and museums. We stayed a across the Potomac at the Ritz-Carlton Pentagon City which was convenient for getting into town as the metro was just in front of the hotel. It was also a novelty as our older son had only been to on the NY subway once and our daughter had never been on the metro so for the first few days, riding the clean trains was part of the fun. 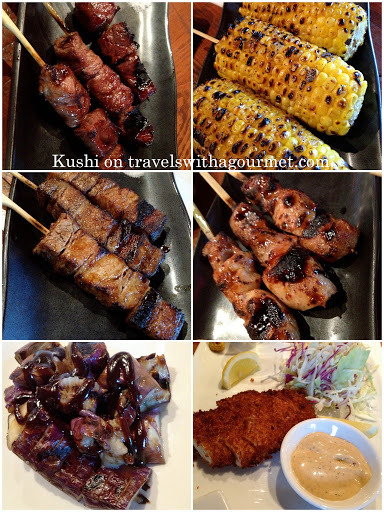 Kushi is essentially a Japanese grill restaurant with a large counter right near the entrance overlooking the open kitchen where Japanese style skewered meat, fish and vegetables are cooked on a traditional Japanese charcoal (binchotan) grill. There are also small plates, tataki and some sushi and sashimi on the menu but the main event are the grilled items. We arrived early for the first seating and settled into a corner of the bar where we immediately ordered some edamame with sea salt to snack on while we studied the menu. We started out with a spicy tuna roll and a shrimp tempura roll which was followed by tofu agedashi (fried soft tofu with broth) then three each of several skewers (priced by stick) to share: chicken thigh, pork belly, beef short rib and corn with soy sauce butter. We also had some grilled Japanese eggplant with miso and tonkatsu which came with a spicy mayonnaise instead of the usual tonkatsu sauce. The food came quickly and was very good – perfect for sharing and also for solo dining of which there were several at the counter. The few tables near the bar started to fill just as we were leaving the restaurant and as it was still light outside, we walked around the block and enjoyed the warm evening – our first in Washington DC. 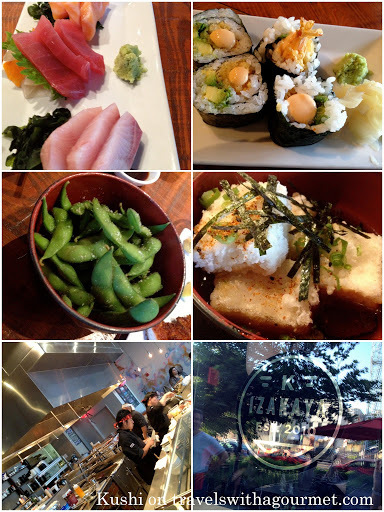 *Open daily for lunch from 11:30 and dinner from 5:30. Brunch on Sundays.